You have picked Estes Park for your upcoming vacation. You have some idea of your perfect place to stay. 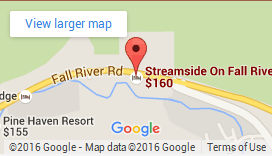 With over 20 units spread over 29 acres, Streamside has just what you are looking for. Streamside has a wide variety of rooms to meet your needs. On Fall River. In the woods. Private hot tubs. Fireplaces. Kitchens. Romantic. Family friendly. Two bedrooms. One bedroom. Intimate studios. You tell us what you want, we have the perfect place!